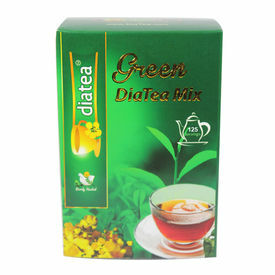 Dia Tea Green Tea Mix - 250 gms - 125 Servings DiaTea, the 100% herbal product has Cassia auriculata flowers as its main ingredient. Consuming this organic herbal tea for 30 days will help you reduce blood sugar level by 40-100 counts. Patients with acute diabetes have benefited from this completely natural product. DiaTea is an herbal medicine for diabetes cure in India that helps in the prevention of diabetes and seven other major diseases. Its major ingredient Cassia auriculata (Avaram) is clinically proven to reduce blood sugar levels up to 100 mg/dl or 35% from high blood sugar levels in just 45 days' time. Cassia auriculata was traditionally used to treat diabetes in China and India. It is now time to make use of this ancient medicine as a natural cure for diabetes. DiaTea not only helps to reduce the excess blood glucose levels but also strengthens the body’s immune system and also is a remedy for various skin diseases. It also helps in rejuvenation and maintenance of health in a natural way. Consuming DiaTea enhances complexion in women. It means that DiaTea is for everyone who wishes a healthy ailment free life.